You are here: Home » Tony Abbott’s Liberal Party take bribes for favours once too often. Time for a Royal Commission! Everywhere you look lately there is evidence of the Liberal Party taking bribes for access to their politicians. The most recent allegation by the ABC and Fairfax Media is that the Liberal Party have been taking bribes off the Mafia. Add that to the recent NSW ICAC Liberal Party bribery scandal and the “Treasure for Sale” defamation case “partial win” and things aren’t looking good for the Liberals. There is a massive storm heading the way of Tony Abbott and the Liberal Party and it is worth having a look at one of the key reasons why which is how the Liberals fund the party and the favours they do in return. You only have to put a few of the headlines together from the media over the last 12 months to realise there is deep-seated corruption in the way the Liberal Party is funded. The story is an old story as any internet search will tell you and one that also includes Labor Party politicians. But it is fair and reasonable for the ABC and Fairfax to focus on the Liberal Party and this time they have dug deeper than before. There will be ongoing bad publicity from this as part two of the Four Corners program is next Monday. It might be a lot worse than the first one for the Liberal Party. A couple of weeks ago (18/6/15) The Australian Financial Review ran a story about Kerry Stokes and the influence he has with the government. It must be true because regular readers know what Kerry Stokes is like with suing. It raises many questions that Prime Minster Tony Abbott needs to answer. 1. Why does he take direct calls from Kerry Stokes? Is it because Stokes donates to the Liberal Party? Is it because Stokes owns Channel 7 and other media? 2. 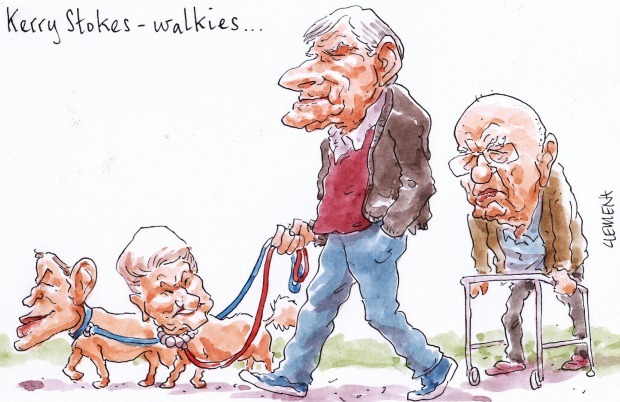 Why did the PM shelve media industry reform after the phone call with Kerry Stokes? What did Kerry Stokes say to the PM to make him shelve reform in the media industry? The fall out and damage from the ICAC investigations and ongoing court cases will do damage to the Liberal Party for years to come. While Joe Hockey might have won the defamation case and been awarded $200,000 (Click here to read) he has done millions of dollars damage to the credibility of the Liberal Party. The case was always about Joe and his ego and he didn’t care what damage he did to the Liberal Party. He was awarded a “partial win” as many commentators are saying. The article he complained about which is titled “Treasurer for sale” (Click here to read) is still on the internet and always will be I suspect. What Hockey’s court case did was highlight the fact that if you want access to politicians like Joe you need to pay big dollars. There is a lot of money flowing into the Liberal Party and everyone who donates seems to want something in return. Worse still, is the fact that the Liberal Party politicians seem happy to do favours for the cash. Even for members of the mafia. The call for a Royal Commission into the Liberal Party and its fund-raising is going to get louder and louder. The Liberal Party have spent tax payer’s money investigating the Unions/Labor Party and that is fine. But now there needs to be a Royal Commission into the Liberal Party and their grubby backroom financial deals. While a Royal Commission will obviously be a few years away and will never happen while the Liberals are in power there is nothing that I can see that would stop the Australian Senate setting up an inquiry straight away. The battle to force the Liberal Party to clean up corruption within their own party has well and truly begun and it will not stop until it is won. It seems very few people within the Liberal Party realise it yet. To receive notifications of new posts on this website go to the top right where it says “Follow this site by email” and about twice a week you will be notified when there is a new article published. As a CONSTITUTIONALIST I ought to make it clear that Ministers are appointed to advise the Governor-General and for him run departments, not on political agenda’s but in the best interest of all citizens regardless to which, if any, political party they belong. As such I view that when a Minister acts to raise funds for his political party he is in my view FOR SALE. In my view a Minister must be accessible for all citizens and not just for a privileged few. Also in my view a Member of Parliament who is elected by having accepted monies from corporations places his/her integrity in question, this irrespective if the monies are paid directly to the Member concerned or directed by the Member to some other account. I have for long campaigned that any corporation that provide funding regarding a political party must be automatically banded for at least 5 years to obtain any contract with the government, as to avoid backdoor kind of bribery. Having attended Liberal Party fund raising events in the past, it was quite obvious that people who donated hundreds or thousands of dollars to attend such an event, where the PM, the Treasurer, or a Minister were the guest speaker, were intent on contributing to that all important effort to keep Labor and Greens MPs OFF government benches. Every time the Unions stump up vast amounts of money to push a Labor/Greens government into being Australia ends up suffering. Even the Greens are funded by the ETU and the CFMEU. They are owned by militant unions. If that is not grounds for suspicion of corruption of political ideals, what is? People who donate are more likely to be thinking of the common good for all Australians. After all, a healthy economy is a profitable one. It’s nice that the mafia are thinking of the common good, and that Payne, Billson and Vanstone do too. Sorry, but I’d prefer a few militant unions over people who traffic addictive substances and do actually murder people for a living! But I guess it’s “just business”, LNP-style. Basically, the LNP are the party of “keeping Labor out”. Compare them to conservatives overseas: Churchill led Britain thru WWII, Lincoln freed the slaves, and the LNP….. did what exactly, ever? Did grubby deals for their business and mafia mates? So what do you say about the Unions paying the labor party millions of dollars? A huge number of union members know that part of their union dues are paid to the ALP and that their union borrows money to top up the ALP accounts during election campaigns. Their might be a few who don’t, of course. But those are the union donations that are given in good faith. Some union outfits have more sinister motives – to obtain valuable concessions which will cost the taxpayers billions of dollars. Example: the Victorian State Government’s deals with the CFMEU prior to building the Wonthaggi Desalination Plant. Talk about Mafia associated individuals donating at Liberal Party fund raising functions pales to insignificance. An important point to remember though: When those fund raisers occur, they are controlled by electoral councils and all funds used to finance election campaign costs. The federal cabinet minister who was guest speaker at such a function does not see a cent of money from one of those functions. He or she might not even be from the same state, and has no knowledge of who is invited to attend or to donate. All that is in the hands of the electorate council advisers. Pretty much the same approach and outcome of similar events held by ALP electorate council fund raisers. I worked for a top 20 Australian company years ago, and senior management or directors were always complaining about being unable to get a meeting with a cabinet minister. Managing Directors sometimes get an appointment, others are told that there would more than 2 years waiting list. Common sense tells you that millions of business owners or CEOs just can’t get a meeting, because there are not that many times during an election cycle available. But, if the CFMEU funded an election campaign, do you think they would have a problem? Not likely. How’s that for double speak. If vaccines work then vaccinated children should be at no risk from the unvaccinated. This is happening in America too and the government there is now practically run by the big corporations. Moderator: Please keep comments on topic. When there was a lot of polio around in the 50’s, it was only mass vaccination that eradicated it, also smallpox. It is the unvaccinated children that are at risk. This is true Angela but we had much more trust-worthy politicians, scientists, including drug companies, doctors and nurses who were genuinely moral and caring and who were prepared to speak out loudly when things went wrong—back in the day. But not any more as it’s all about the massive evil greed factor of dirty money and deeply ingrained dirty corruption that has “shut down and shut up” (out of fear) the DO NO HARM good citizens of the world for at least the last 30+ years. There is NO MONEY to be made or saved out of “HEALTHY CITIZENS” and the all worldly greedy powerfuls can’t have the world that way regardless. to leave you in no doubt about what is happening with the forced vaccination schedule and who is funding it. Tony Abbot is a part of that! All political fundings / donations should be revealed to the Australian public for every party and politician. I think you might be flogging a dead horse over the 4 corners Fairfax joint effort. If the revelations were so damning, how come the program has caused barely a ripple anywhere? As to the NSW Liberals, it seems the people resigning for taking donations from companies tied to developers, who for some reason are apparently worse than corrupt unions feeding money to the Labor party in return for grants and favours, did little to impact on the voters. Maybe they saw the hypocrisy of Labor figures being found corrupt going unpunished and compared it to Liberal figures resigning for the good of the party. Nothing could have given the Libs a bigger boost in my opinion than getting rid of O’Farrel anyway. Labor are probably kicking themselves for going after him via their media friends. Exactly, nothing of importance being said about it, Twitter especially is the almost sole habitation of rabid lefties and their attention span is about as long as the 140 characters of their rants. Much the same with Facebook outrage sites. After the landslide of the O’Farrel win there was no way Liberals would retain all the seats anyway and they didn’t even stand candidates in some of the seats where members resigned in disgrace, which really peeved a lot of Liberal voters in those seats so 14 seats is hardly anything to be too worried about. I think the lack of comment in mainstream is probably a case of waiting to see what comes out about Labor in episode 2 given the number of times they have intervened for criminals, even writing references for them. If you hadn’t noticed, Murdoch keeps the LNP as pets. This is why News Corp newspapers, which set the news agenda across the country every day, didn’t go completely feral over these allegations of *mafia* money going to the Liberal Party to keep a *violent criminal* with string mafia connections (to put it mildly) from being thrown out of the country! Does your memory of the Murdoch press backing Kevin Rudd prior to the 2007 election? I am fairly certain that Mr Rudd was not associated with the LNP and still isn’t. But you may be able to enlighten me on that point. I have lived with politicians “serving” me for seventy eight years and have a very cynical view of them all.The fact that the ABC and garbage newspapers like Fairfax are so left wing and biased toward the Labor and the Greens that I suppose the Liberals have to go exceptionally lengths to even up the playing field. This is not an excuse for inappropriate behaviour from any politician who is put in a position of trust by the naive, yes naive electorate, is a polite word for half of us do not know what they are voting for. All the blabbing in the world will not see the corrupt one’s in jail so let’s live on and pick the lesser of the two evils. Hypocrisy is not limited to the Labor party although they have made an art of it. If all past and present politicians were where they belong Australia would return to the penal colony it once was, “you don’t have to have a criminal record to emigrate to Australia unless you want to be a politician” Allan from Myalup WA.. I tend to agree with Allan, if there is any concrete proof of this so be it. If however it is the MSM kicking against the LNP and the ABC in particular. So if we have no choice about who screws us to the hilt, how do I go about Succeeding from the colony and pay none of the crooks? Your consent to be part of the “Colony” was obtained the moment your birth was registered. Renounce that and you have seceded. That’s when the fun really starts. Good to see that you know the Liberal Party is NOT God’s chosen few. Just as rotten as Labor and trade unions. The big charity fundraiser for the Parliamentary Winter Ball is the bidding for access to the politicians, be it a breakfast, lunch or dinner. That would come under a politician for sale, though their party doesn’t pocket the money but a charity. It is the lobbyists that are the problem with getting the ear of the politicians for the industries/organisations they represent then donating to the political parties of those politicians, depending on the outcome of that lobbying. Industries/organisations are concerned about their survival and profits as is the case of Murdoch and Stokes because any changes to media laws would have a dramatic impact on them. Unfortunately for the Coalition, they do not have access to the funds Labor does through its unions so they have to go down this track of dealing with lobbyists.. It is not money that goes into the politician’s pocket but it is money needed for campaign funding which is getting more and more expensive in view of the nature of campaigning. Make it a level playing field then we might have a different scenario with grass roots party branches being more important in raising money and having more input as to their chosen candidate. There are many faults in our political system. Like many that are now Independent Votes (with NO Party Allegiances), I’ve really developed a “Zero Tolerance Level” to any form of Corruption,Incompetency or Unethical Behavior within the Government, whether it comes from one side of the house or the other..!! It would appear that our Politicians spend too much time asking themselves can they do something (and get away with it), rather than asking themselves should they do it…!! The ABC and Fairfax can only report on what they see fit, but it is up to we the people to take on the information and make our own minds up, personally I think that the stories have merit and deserve being put before a Federal ICAC Style Commission..!! If the Liberals have done nothing wrong, they should have nothing to worry about now should they, but if they have then it needs to be fully investigated and the cancer cut out… for the Good of the Nation..!! Thing is as you would have seen with the NSW ICAC, a Liberal politician gets found to have not reported some piddling amount and it is the end of the world with the media hounding them into resigning. A Labor politician gets shown to be corrupt handing out mining permits and profiting from it, getting free units in Harborside apartments, the media response, nothing to see here folks, move along. Just look at Sinodinos, called to testify at ICAC, hounded till he stepped aside. Shotern named at least 5 times already as being complicit or worse in selling out union members and called before the TURC, well it’s all just a Liberal witch hunt, nothing important, no reason for Shorten to stand aside. A Federal ICAC would be treated just the same. 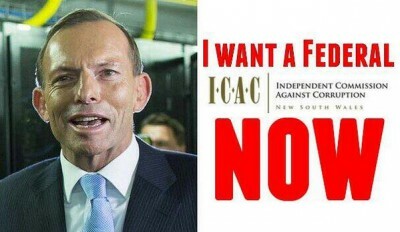 We definitely need a Federal ICAC for the politicians and that also looks into what goes on in the A.C.T. The A.C.T. seems to think that they are similar to the City of London or the Vatican city where they can do what they like while the rest of country can be placed under scrutiny. Is this not bribes for favours and will no doubt all be disguised without indentifying the actual donors!